It’s true. 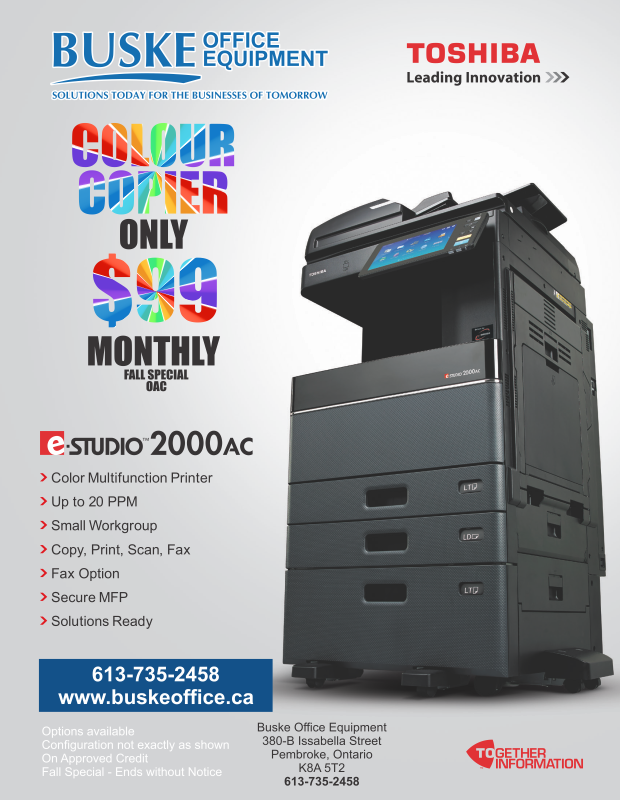 Your office can enjoy the amazing full functionality of a colour copier/printer for the low monthly payment of $99.00. For a limited time, we are offering a Toshiba colour MFP at this low monthly payment. Fully functional with Copy, Print, Scan, and Fax. Arnprior, Barrys Bay, Beachburg, Calabogie, Cobden, Combermere, Deep River, Eganville, Fort Coulonge, Que., Ottawa West, Pembroke, Petawawa, Renfrew, Stitsville, Whitney, Chapeau, Que. © All rights Reserved. Buske Office Equipment 2018.